Kiekert's i-protect system uses sensors to activate a door brake that prevents doors from striking nearby objects. 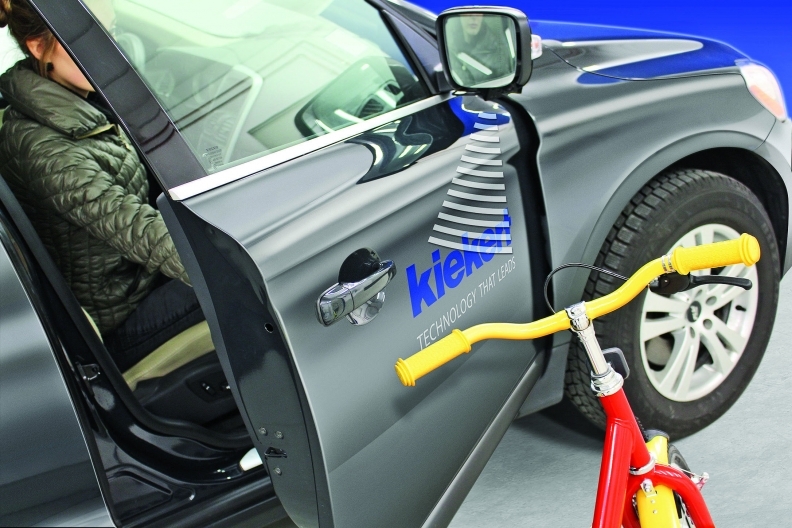 Kiekert, a German supplier of door latches and locking systems, has developed a technology to solve the age-old problem of door dents. Kiekert's system, marketed as i-protect, uses sensors to prevent doors from striking nearby vehicles and objects. Kiekert says the sensors electromagnetically activate a door brake to stop the vehicle's door from striking and denting the vehicle in the adjoining parking space, or hitting a parking meter or a garage wall. The innovation was initially developed by students at a high school in Cologne, Germany, as part of a contest sponsored by Boston Consulting Group. Kiekert supported the student team that won a Germany-wide competition with the idea. Kiekert engineers then developed the students' concept into a working prototype. Hector Verde, Kiekert director of product development for the Americas, says the company is in advanced discussions with an automaker for production in 2020, but declined to name the customer. I-protect is designed to detect stationary objects. The next-stage system will detect nearby moving objects, such as cars, bicycles or pedestrians, Verde says. I-protect is one of several electronics innovations Kiekert is working on that bring electronics to traditional mechanical doors and door-locking systems. Kiekert, which claims to be the world's leading manufacturer of side-door latches, also has developed a product called LED-Latch, which integrates a safety warning light into the opening of the door latch. The light alerts oncoming vehicles or pedestrians that the vehicle door is opening. It is meant to replace warning lights that are usually mounted farther inside on the side door panel, enabling approaching vehicles to see the door sooner. A third product, E-Latch, enables a passenger to open the door by touching a pad, which activates the door latch electronically. Kiekert says E-Latch would allow carmakers to dispense with physical door handles or incorporate the touch function into a handle. The company says E-Latch will appear on a production model next year, but declined to say what vehicle or manufacturer. Kiekert estimates that it leads the market with 35 percent of side-door locking systems in Europe, 25 percent in the North American Free Trade Agreement region and 20 percent in China. A typical door latch has 30 to 50 parts, while more complicated ones can have as many as 130. Says Verde: "It's not recognized, but with the exception of an engine, a door latch is one of the most complicated mechanisms in a vehicle."